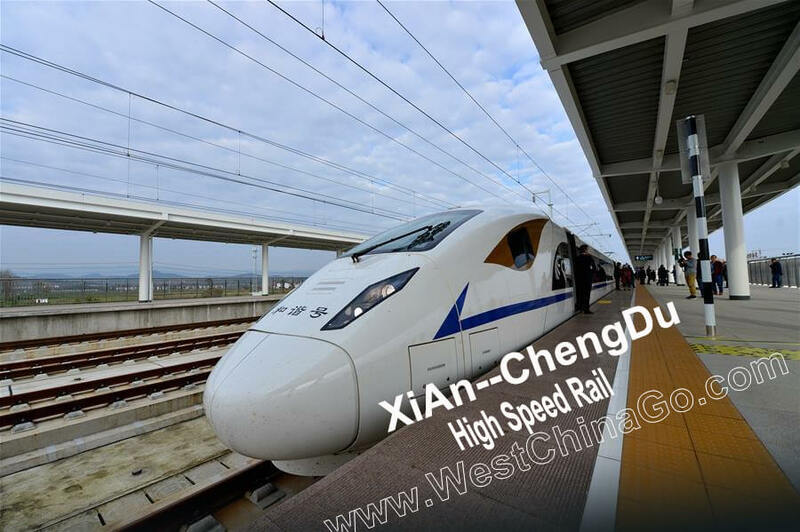 High-speed rail is the most convenient and efficient and economical way.comparing to flight, we more recommend high-speed rail. 2)price comparison, high-speed rail has more advantage. *after speed acceleration in near future,only 3 hours for arrival.now in the begining stage,usually need 3.5-4 hours. 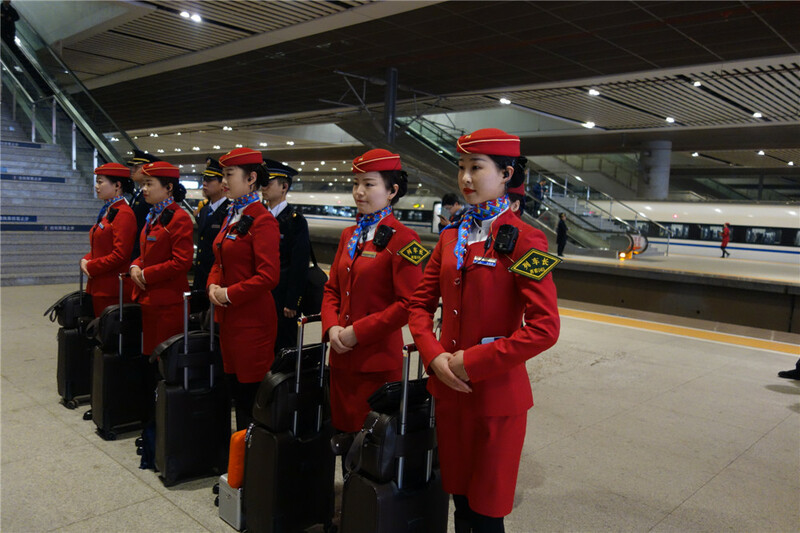 Attendants of the Xi’an-Chengdu high-speed rail line are ready to begin their first day’s work in Xi’an, Shaanxi province, Dec 6, 2017. 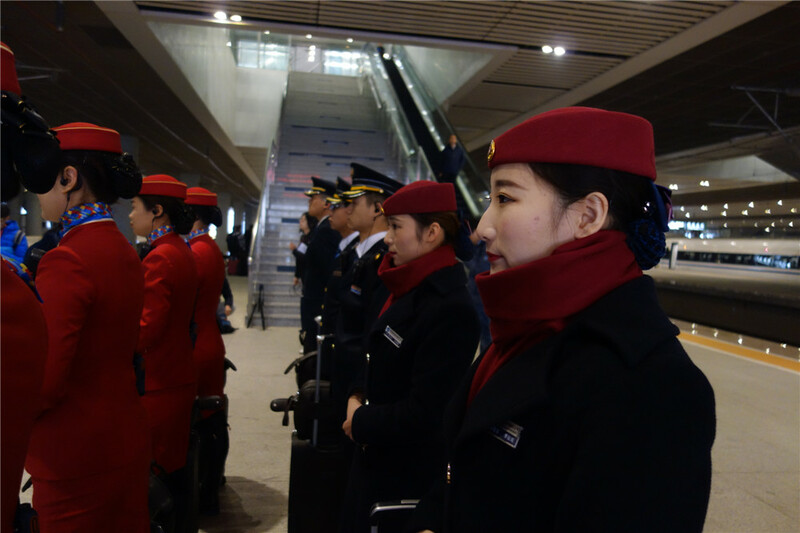 As a bullet train set out from Xi’an north station on Wednesday morning, a new high-speed rail line in western China opened, greatly reducing travel time. The Xi’an-Chengdu high-speed railway links two ancient cities, Xi’an, capital of Northwestern China’s Shaanxi province, and Chengdu, the capital of Southwestern China’s Sichuan province. The 658-km line is the first high-speed railway to pass through the Qinling Mountain, the dividing line of China’s northern and southern region. The initial operation speed is 250 kilometer per hour. Some 38 trains will operate in the initial phase, 19 on each way. The bullet trains reduce travel time between Xi’an and Chengdu to 4 hours and 7 minutes from about 11 hours. Cheapest seat costs 263 yuan ($40), double the slow train’s ticket price, which costs about 130 yuan. With a new train diagram to be put into operation at the end of this year, travel time between the two cities will be further reduced to only 3 hours and 27 minutes. By then, the new line will shorten rail travel time between Chengdu to Beijing to about 8 hours from current more than 14 hours. A new bullet train service linking Xi’an and Chengdu went into operation on Wednesday, reducing travel time between the two historic cities by almost two-thirds. The 658-kilometer high-speed line is the first to pass through the Qinling Mountains, the dividing line between China’s south and north, which boast a vast array of natural scenery and rare wildlife. Thirty-eight trains will initially run along the railway, 19 each way, at speeds of up to 250 kilometers per hour, according to network operator China Railway Corp.
Travel by rail between Xi’an, capital of Shaanxi province, and Chengdu, capital of Sichuan province, is now just over four hours, down from 11 hours using the standard train services. This is expected to drop by another 30 minutes or so in coming weeks. However, faster travel comes at a cost. 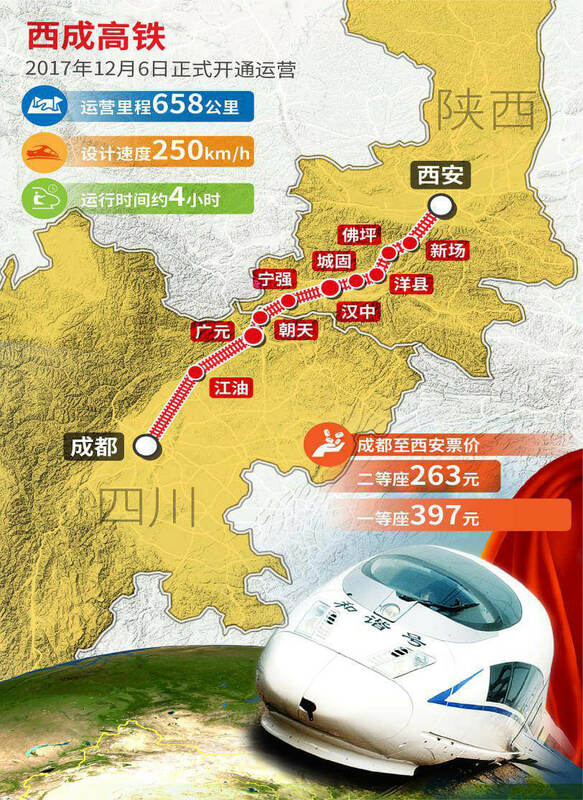 The cheapest ticket for a seat on the high-speed train costs 263 yuan ($39.80), double the price of a slow train. The new line expands transportation capacity north of the Sichuan-Chongqing region, linking the Yangtze River region and the Bohai Sea rim, said Zhang Zongwei, head of the Sichuan section of the railway’s construction team. Yet the unique geography was seen as an advantage during World War II, and Chongqing was chosen as a wartime capital because it was seen as easy to defend and extremely hard to invade. 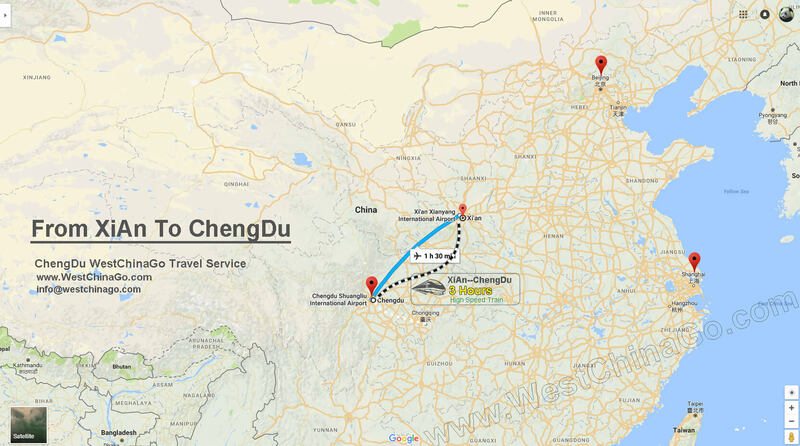 When the speed on the new line is increased, the travel time between Chengdu and Beijing will be cut to about eight hours, down from more than 14 hours, meaning the “journey to Shu” will no longer be so difficult. The new line is an important part of China’s high-speed railway network, linking three high-speed lines — Xuzhou-Lanzhou, Datong-Xi’an and Chengdu-Chongqing — according to CRC. The Xuzhou-Lanzhou line links eastern and western China, the Datong-Xi’an line connects central and western China and the Chengdu-Chongqing line links two major cities in southwestern China. The new line also runs through poverty-stricken areas in the Qinling Mountains and the Dabashan Mountain region. “The new line will boost the economy along the railroad and help carry out the regional development strategy, boosting economic and social development along the line and also improving local people’s well-being,” said Song Ying, deputy head of the railway construction team’s Shaanxi section. China has a high-speed rail network with more than 22,000 km of track in use, accounting for 60 percent of the world’s high-speed railways. The nation issued an updated national railway development plan in November envisioning 30,000 km of high-speed railways by the end of 2020. The plan also stated that more than 80 percent of big cities will be covered by high-speed railways by then. By the end of 2020, railway travel time between Beijing and most capital cities will be reduced to two to eight hours, the plan said.